"What Is The BEST Inflatable Boat To Buy?" That is a question I have asked as well. When I first decided to buy an inflatable boat, I knew almost nothing about them. I bought a 30 year old Zodiac from our neighbor for cheap, and a nice new 20hp motor. It was great! The kids loved it! Camping, fishing, tubing, exploring...... the possibilities were limitless! On closer inspection a few seams were coming apart, the material around the transom was peeling off, and shoe goo sealed up a few holes..... but it held air! We all dreamed of great adventures! Then a friend told me a story about what happened to him in an old inflatable while boating with his wife one day. I realized I needed to learn more about inflatables. So began my passion for inflatable boats. What is the best boat to buy? what types of inflatables are available? what materials are inflatable boats made of .... and which ones are better? how can you tell a good brand from a poor quality brand? how to haul your inflatable on a trailer. I could go on and on about the benefits of inflatables! Safe, fun, portable, durable, economical to operate, the four wheel drive of the sea! .....not all inflatables are created equal. These boats range from very durable to very fragile. You don’t want to be stuck with one that is not going to do what you want it to do. So take some time to learn about what to look for and what to avoid. I wish I had! It would have saved us a lot of time and money!. You want a safe and enjoyable experience with your boat. Motor through some of these pages and gather information to help you make an informed boat purchase decision. Most information on the web and from dealers is slanted toward the boat brands they sell. There seems to be very little information to simply help people make a smart choice when buying an inflatable boat. There are so many inflatable boat types available, figure out which type of inflatable boat is the BEST BOAT FOR YOU before buying! Cheap Inflatable Boat Manufacturing: How Is A Discount Inflatable Boat Made? Cheap inflatable boat manufacturing varies a lot from company to company! Here's how to find a good quality inexpensive boat. Save money by buying an cheap inflatable boat . Here's what to look for. Many cheap inflatable boats are made in China. Some are good quality. Others are not. Here's how to tell the difference. Cheap Inflatable Boat: A Inflatable Boat Toy Is The Cheapest Boat Of All! A cheap inflatable boat of unsupported PVC is a great toy or packable fishing platform for small lakes. Buying a used inflatable boat is a great money saving idea - there are things the seller doesn't want you to know, and may not know themself! I own an inflatable sport boat because they perform well on the water and still can be carried in the back of my truck. RIBs are the safest most seaworthy boat available, and are perfect for all kinds of water sports, find out how to choose one that would be best for you. Whiteater thrills or lazy afternoons floating on the lake - inflatable rafts cover a wide spectrum of sizes and quality. Rafts have flat bottoms and no transom to mount a motor. Inflatable Pontoon Boats - Super Light - Super Fun - Fishing Or Whitewater! Inflatable pontoon boats will get you on the water for fishing or running whitewater. Fun, stable, fun, easy to set up, and did I say fun? Boat maintenance costs are small compared to the cost of repairing a boat that has never been maintained. A boating accessory checklist for your inflatable boat will include a boat horn, an anchor system, a beach anchor, and safety gear. How to choose the best quality boat anchors. Feel confident that your anchor set will hold! Using boat trailers to store and transport inflatable boats makes sense. You'll do less maintenance, get in the water quicker, and have fun faster! These essential boat trailer parts make the whole experience easier and safer. Good waterproof boating apparel is critical when you own an inflatable boat! Here's what to look for. 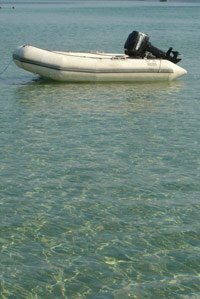 Inflatable Boat Repair - Do It Yourself Or Boat Repair By A Dealer? Inflatable boat repair is best done in a carefully controlled environment with the proper tools, but you can make do it yourself repairs in the field. Inflatable fishing boats are very versatile seaworthy boats that vary from tiny packable versions to full size Ribs outfitted for offshore. 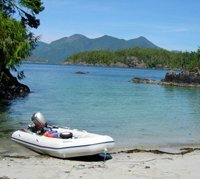 After we bought our first inflatable boat Canada became an even more amazing place to explore! Small boat fishing and just boating in Canada. Would you like to share your knowledge about inflatable boat? Great, find out how you can submit your story or tip here.